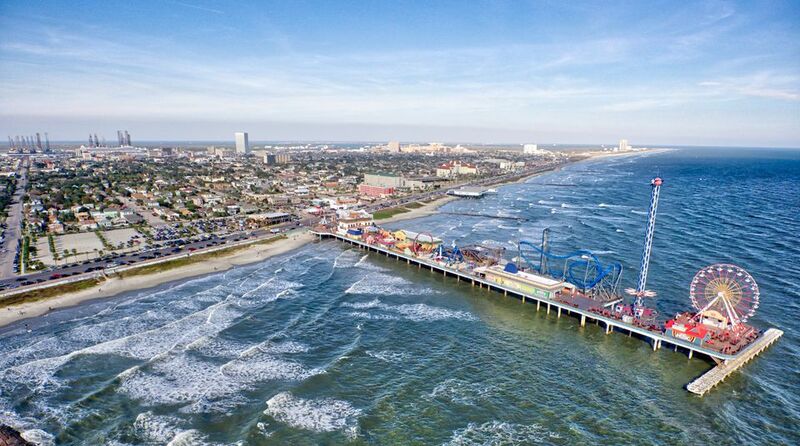 Galveston, Texas, offers couples a range of activities to do on a romantic weekend getaway or longer. Whether art and architecture is your thing, you like the beach and birding, savor history or adventures on land, sea, or in the air, Galveston offers plenty to see and do on a honeymoon, weekend getaway, or romantic escape. Below are some of the loveliest activities for two on Galveston Island. Romantic couples are partial to Hotel Galvez, a treasured Galveston landmark. For a century, the "Queen of the Gulf" has stood across from the Gulf of Mexico. Recently renovated, the hotel is a four-star AAA property. Couples appreciate the heated pool and modern spa. But the beach is just across the highway, beckoning you to stroll, bike, and cool off in the water. Couples who prefer to be downtown can bunk at the equally historic Tremont House, which some say is haunted. If you like to be where the action is, Moody Gardens Hotel (check rates) is near the waterpark, beach, aquarium, IMAX and more. Traveling with kids? The San Luis Resort (check rates) has a pool bar; with screamers around, you'll need it. Galveston has gone through devastating times but comes back stronger each time. In 1900, the Great Storm swept across the island, submerging much of it and taking thousands of lives. The city responded by building a 17-foot-tall seawall behind the beach to protect it from swells and hurricanes. At Pier 21 downtown, catch a showing of "The Great Storm" documentary for context. A more romantic view of Galveston can be seen in its historic homes, which were occupied by the city's leading families. Moody Mansion and Bishop's Palace are well-preserved Victorian structures that couples may tour. Three-quarters of all North American bird species (some 500 different types!) travel through Galveston during their migratory periods. That makes birding a favorite Galveston past time for lovebirds. The best place to observe the wing-flappers is East Beach. If you can spot a roseate spoonbill, you've viewed the area's favorite feathered friend. Enjoy a romantic dinner at Trattoria La Vigna, a top Italian restaurant located right downtown. The pasta is freshly made, and the prices are reasonable. Want to check out other popular Galveston eats? Try Rudy & Paco, a romantic local haunt where grilled steak and seafood star, or Gaido's a classic seafood restaurant that also serves a famous Texas-shaped pecan pie. For the best views in Galveston, take the elevator from the lobby of the Moody Gardens Hotel up to Shearn's on the ninth floor. Comfortable lounge seating, a pianist, and a well-stocked bar make this convivial spot the place to go to salute the sunset and stay for seafood or steak. It overlooks the prettiest part of town and provides romantics with a clear view of the Moody Gardens pyramids and the Galveston waters beyond. If you understand that Galveston is a major commercial shipping port (so it's neither pretty nor scenic), you can enjoy—or at least find interesting—the Baywatch Dolphin Tour. In 45 minutes, you'll sail past rusted oil rigs, responder boats poised to react to the next oil spill, the ferry terminal that takes passengers between Galveston Island and Port Bolivar, World War II vessels and oil tankers, loading docks, Sea Wolf Park, and a Halliburton facility. Every six weeks or so, Galveston artists open their studios at night and invite the public in to see their creations, many of which are for sale. Romantic couples can browse, and the experience is enhanced by the offer of complimentary wine served in most venues. Art Walk takes place primarily along Postoffice Street in the heart of the downtown Galveston historic district, where it is legal to carry alcoholic beverages outdoors. Art Walk is a friendly, civilized event for adults, and folks seem to enjoy themselves without getting sloppy or rowdy. Turn off the television and head to The Grand 1894 Opera House of Galveston. This city landmark mounts on its stage both high and low cultural events that range from Galveston Symphony Orchestra to puppet shows for kids. Sophisticated, romantic couples will enjoy holding hands and watching visiting balladeers, modern dance troupes, and theatrical shows, both classic and contemporary. A romantic Galveston tradition, brunch at Bernardo's in the Hotel Galvez is a cornucopia of excellent food. Whether you like to start the day with a made-to-order omelet, fresh Galveston Bay shrimp, bourbon-glazed ham or all of the above, it's beautifully arrayed here, and you're welcome to all you can eat. The room itself is quite beautiful, with large arched windows overlooking swaying palms and Galveston Bay. Just leave room for dessert, where the selection will leave you with a sugar high.